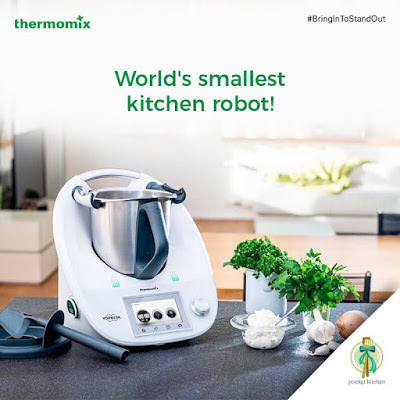 Is this an appliance" A machine" A gadget" Nope, Thermomix is a Kitchen Robot! A one stop assistant that's all you'll need.. The concept is simple - To simplify cooking and simplify life. Thermomix TM5 is a premium product from the house of Vorwerk & Co., a company that was founded in 1883. Vorwerk is well-known for its premium appliances and household products across many countries. Thermomix TM5 takes a bit of a learning curve, but once you have mastered it (which is fairly easy to do) you will thank your stars for it. I was happy to be part of a demo arranged at their Bangalore office, called (aptly so!) the Pocket Kitchen. The premises is aesthetically designed with an open kitchen space, ample seating and a service center as well. Quite a handful isn't it"
The unit includes a Stainless Steel mixing bowl, a lid that mechanically closes once the function is selected, a simmering basket, the Varoma Steaming basket, butterfly whisk, spatula, measuring cup and the multi-purpose blade.